I love to enjoy this traditional beef chili during the colder days. 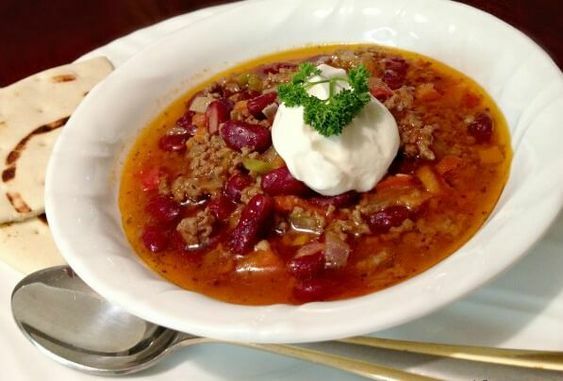 Delicious beef chili is beneficial because its full of healthy vegetables that contributes to the daily value. Beef chili also is a great source of high protein that is in the ground beef. Ground beef is also high in carnosine which improves performance during exercise by reducing fatigue. Spices and herbs such as cumin and oregano contain antiviral properties. They contain vitamin B and more disease-fighting antioxidants than fruits or vegetables. In a large cast iron pot heat olive oil over medium heat. Add the onion, red bell pepper and carrots, put the lid on and cook until the vegetables are tender, stirring occasionally. Then add the ground cumin and cook for one more minute. Raise the heat to medium high and add the ground beef. Cook until the meat is no longer pink, stirring occasionally and breaking up the beef with a spoon. Add the diced tomatoes, Picante Sauce, water, dried oregano, salt and pepper and stir until the ingredients are mixed well. Partially cover the pot and cook on low for 30 minutes, stirring every ten minutes. Stir in the beans and cook for 20 more minutes. Serve with sour cream and bread. Enjoy!